Representation has had a bad century or so. First of all photography turned up and seemed to offer something better at the press of a button. Then abstraction and conceptualism said it was irrelevant anyhow. Enough time has passed now to see that none of the new kids on the block are doing a very good job of reaching people other than the cognoscenti . The art market loves the idea that it is they and they alone who assign worth and the afficianados revel in the obscureness of it all. The average person if such exists however seems unmoved. There is plenty of visual fodder for the everyday viewer, film tv etc supply an endless stream of content. Very little aesthetic stimulation is supplied by paint on canvas however. The interest is there. 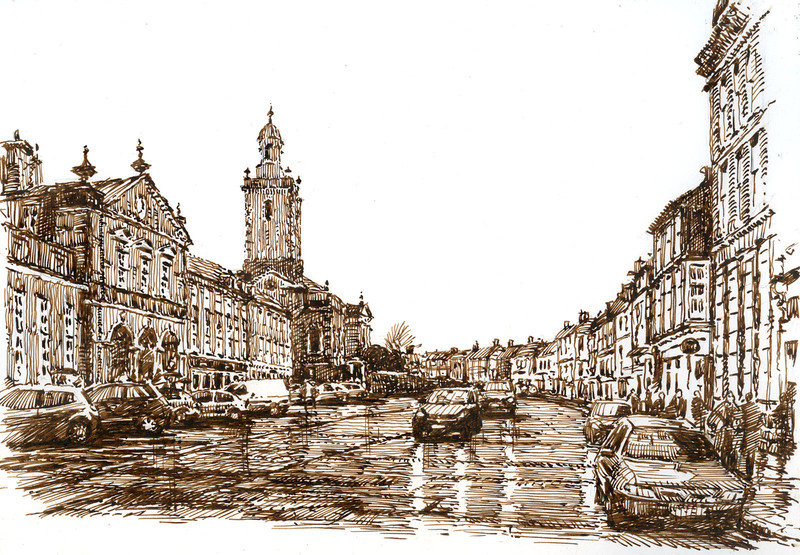 If I paint in the street a plenty of interested people watch you and come and chat to you. That is in itself odd as it takes quite a lot for most people to engage a total stranger in conversation. 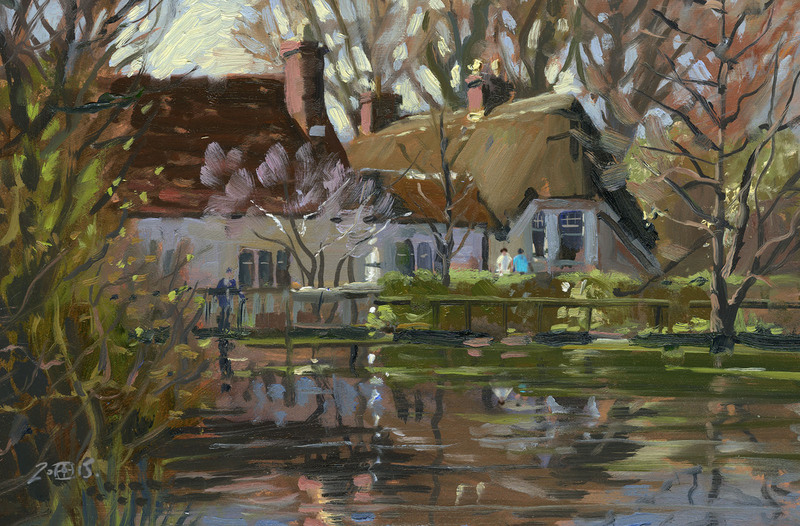 When a while ago I painted outside the Bankside Gallery, a more or less constant stream of people stopped and chatted. I know some of the interest is to some degree similar to watching a magician pull things out of hats, but most comment on the image as well as the act of making it. How to harness all this interest is a conundrum though. So why do painted images of our world still hold such fascination? You would think there would be little interest, it is not that you are making a copy of the scene, cameras do that all the time. No one ever hovers near to an iPad snapper to see how the picture came out. Photos have perhaps become so ubiquitous that we tend to dismiss them and those who take them. We are after all of us casual photographers now, the process has no mystery for us, the revolution that the Box Brownie started has run it’s course. In some ways I wonder if the small renaissance in representational painting is being helped along by the over abundance of the mechanicaly produced image. There is also as I said before the fascination of seeing something that is very hard to do done well, just as we like to watch high achieving sports persons, the same seems to apply to painters. Painters however are not street performers they produce an end product. Unfortunately the market for such items could be kindly described as “niche”. Though companies like to sponsor sport, opera and theatre, individual or groups artists are unlikely to become recipients of such munificence. I suppose I could try product placement with Coca Cola cans prominently featuring in the picture! We make images designed to be “hung on the wall” which alas look increasingly out of place in a modern pared down interior. Framing has become a nightmare as you have to imagine what will look good when teamed with an Ikea coffee table called Schnurdle! The annoying thing is that I suspect many people would gain pleasure from having a landscape on their wall but somehow the picture selling business cannot reach them. Galleries don’t help, often by seeming unwelcoming to the casual browser. I quite like galleries with cafes, in the same way as bookshops have found, people will pop in for a coffee and then hopefully look at the paintings too. I have now completed my exodus to the country so hopefully I will be getting a more regular flow of posts going. I have already got a list of scenes I would like to paint. Here are a few to start with! At last I have my studio up and running so to celebrate I painted this. I realised I had hardly touched the oils recently once I started as I felt distinctly rusty. This is the wonderful Fontmell Down in Dorset. 20in by 20in oils. Full of the joys of spring I set out on another only to get a little stuck. I find pictures that almost work harder to come to terms with than outright failures. They tend to sit around waiting for their moment to be scrapped or fixed. 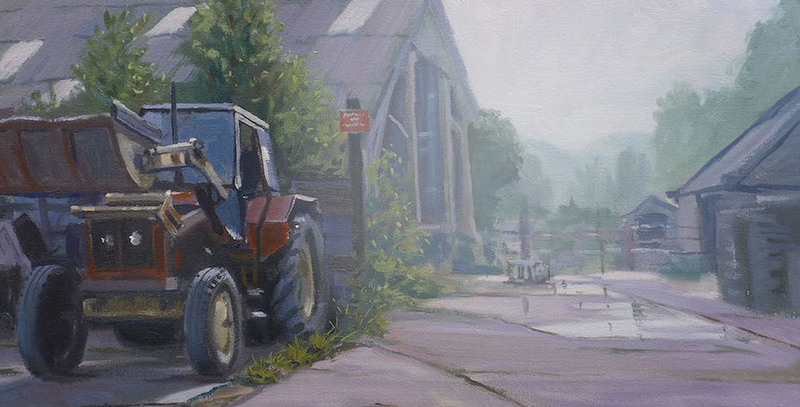 This one of a local Dorset farm was meant to be about the milky light… but somehow became about a tractor. I have decided to crop it cruelly so it will have to wait to be a little dryer before I re-stretch it to a new format. Below is how I feel it should be cut down. Much more to be done but I think this has more potential. This is a bridleway a few hundred yards from my new house in Child Okeford. So great to see that the light is good and be able to pop out and paint. 7in by 10in Oils. 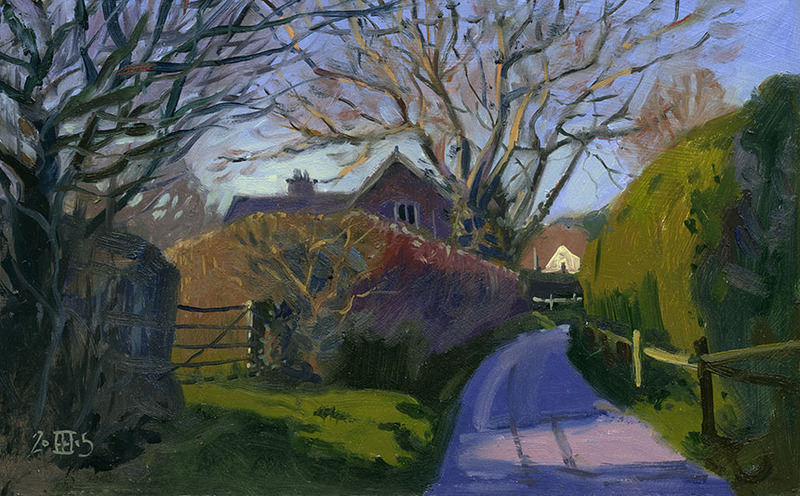 This is Springhead near Fontmell Magna, lovely gardens almost too pretty to paint. Some lovely subtle colours and it was fun trying to show the transparency of the spring foliage. 10in by 14in oils. 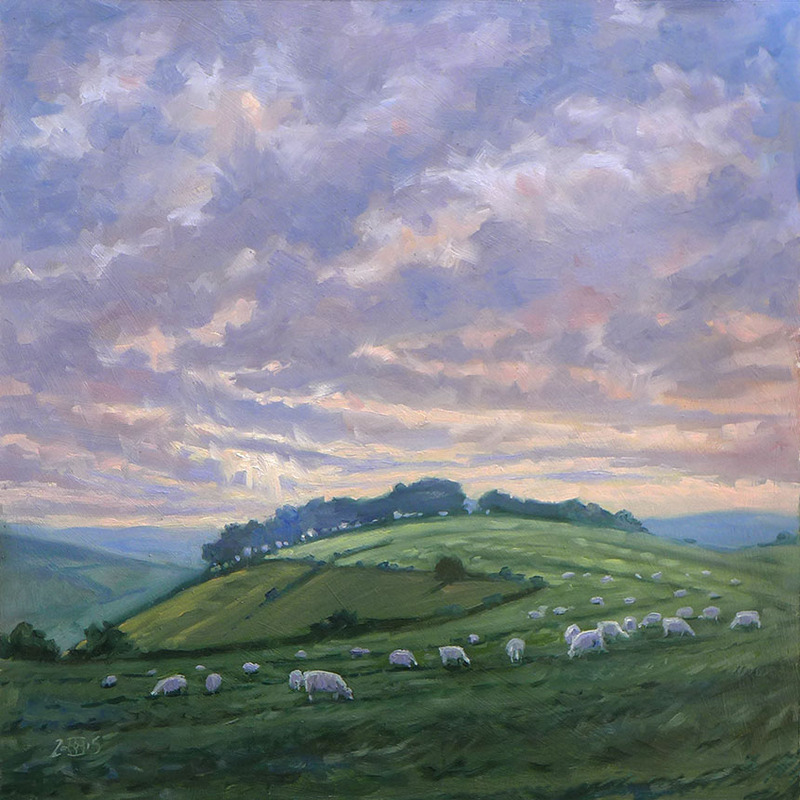 Last of the oils, I love this view of Hambledon Hill as it changes so much with the light. I did this slightly larger than I usually paint outside at 10in by 26in with the result that it would not go in my panel carrier… I duly dropped it butter side down as I carried everything back to the car! A little grit adds character I suppose. This took a couple of visits as I got rained off. I can handle just rain but as soon as the wind gets up a bit you just have to stop. I returned almost a week later to finish. Dry alas so I had to imagine some of the reflections. 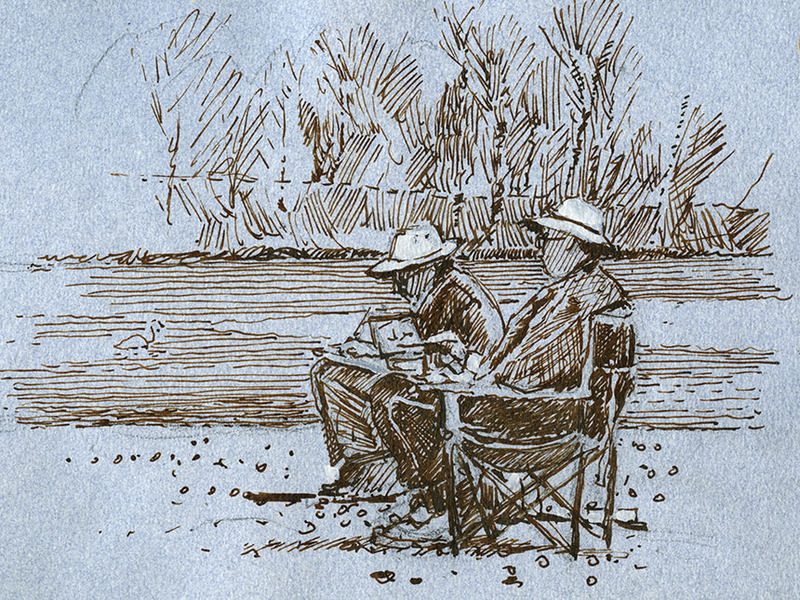 Lastly a sketch of Steve Alexander and John Bryce painting away on the foreshore at Isleworth before the Wapping Group AGM.